I have always admired the family cook who pours love into favorite family dishes. 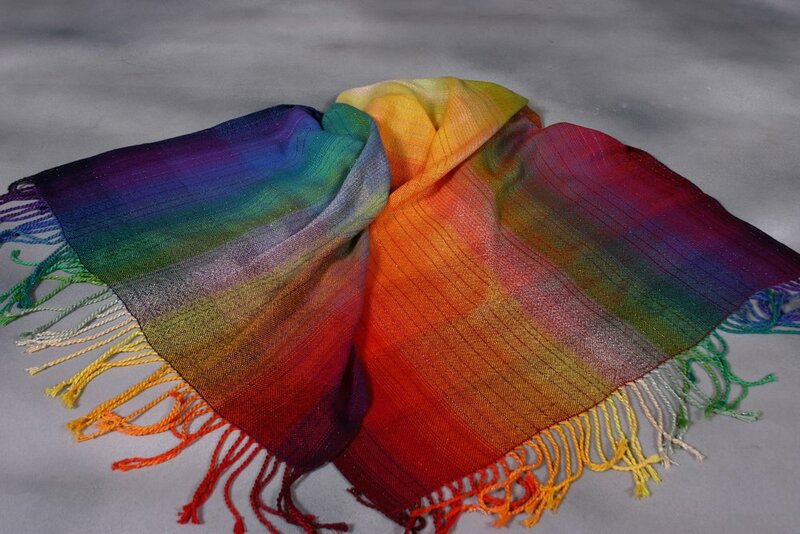 I am no cuisine maestro, so I try to pour love into my handwoven scarfs and shawls. As the Alliance Gallery’s featured February 8th “Second Saturday” member artist, I have an opportunity to share my approach to weaving. As I weave, throwing the shuttle back and forth, I silently hold words of wisdom as though they were lines of a poem. Each scarf or shawl has its own unique words. If heart-felt vibrations can be captured by fiber—just like a lovingly prepared meal nourishes us—I am happy. I usually sit quietly before I begin a weaving, wondering what words go with it. Here are some examples: “Good memories are like lavender fields under a blue sky.” “Faith is the root that holds you up when all the leaves have fallen.” “The deepest strength comes from within, just as an oak comes from an acorn. Where did this all begin? How did I start to connect words to fiber? Perhaps it began because I also like to write and have published books on topics ranging from electric cars to silence and a contemplative life style. But in truth, I think it really began when I went on a Native American-based vision quest in the southwest. Along with seven others, we each found solitary locations along an arid landscape to live in isolated silence and fasting for five days. We were told, “You might find a medicine name for yourself,” which to me meant a name with deep and hidden meaning. When we returned to base camp, we shared our names … Wounded Bird, Rainbow Walker, Thirsty Squirrel. I decided to weave a scarf for every person, asking myself, “What color(s) would Thirsty Squirrel or Rainbow Walker be?” Thus began my connection of color, weaving, and meaning. I called it weaving with meaning. In reality, learning to weave did not come easy. I was the slowest student. I had no prior handicraft skills. Weaving seems to consist of a hundred tiny repetitive steps—and apparently, I love repetition. Once I was asked if I was a writer, and I answered, “No, I write, but I’m not a writer.” This raised major objections by my friends. Then I began to weave, and even though I was absolutely awful at it in the beginning, I exclaimed to those same friends, “OHHH, I’m a weaver.” I realized I had been weaving things together all my life—information systems, words, fiber, jewelry. Today, when I weave a commissioned piece, I ask three questions: What do you want to wrap yourself in at this point in your life’s journey? Perhaps the person says joy, courage, love, peace. Once that energy has been identified, I ask the person to let IT tell them what color(s) it is. Women often have favorite colors—but maybe THIS shawl or scarf wants to be an unfamiliar color. Lastly, I ask what words the person would like me to hold as I weave. I have sung songs—even in foreign languages, recited poems, or held single words. When I began, I had serious doubts about what I was doing. But when I attended my first conference as an exhibitor, one woman walked into my booth, went immediately to one shawl saying, “I have to have this,” read the words silently woven into it, and burst into tears. A year earlier, precisely when the shawl was woven, she was fighting for her life in ICU—and the words I had held while weaving were the same words she had been praying. After that experience, I never looked back. I just keep on—adding words to weaving. Silently. An opening reception will be held on Saturday February 9 from 5 until 8:00. All are welcome to join us! When Plain Air Becomes "Plein Air"